Amy and Dustin’s love for each other was so apparent from the moment we met the couple, and we were thrilled they asked Weddings By Dzign to be a part of their Big Day. Amy was inspired by the spring season and wanted an aesthetic that was airy, light and ultra romantic. 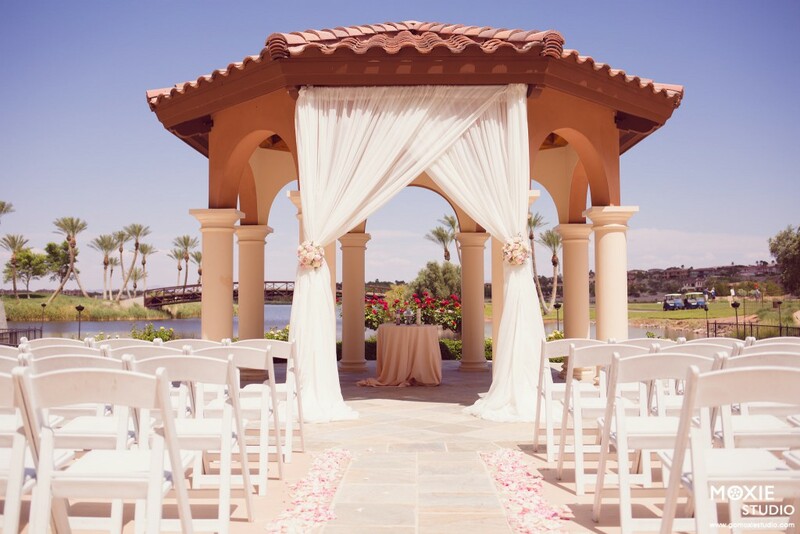 We went with an ivory-and-pink palette for the ceremony, which worked so well against the Westin’s beautiful gazebo ceremony space. We brought in simple ivory draping and popped the altar space with pink-and-ivory floral ties. 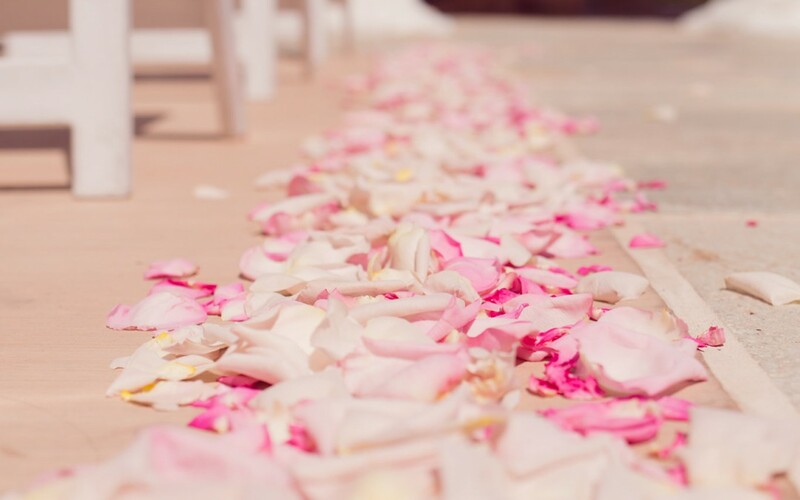 We then lined both sides of the aisle in pink rose petals, which helped to define the space and added a perfect pop of springtime color. 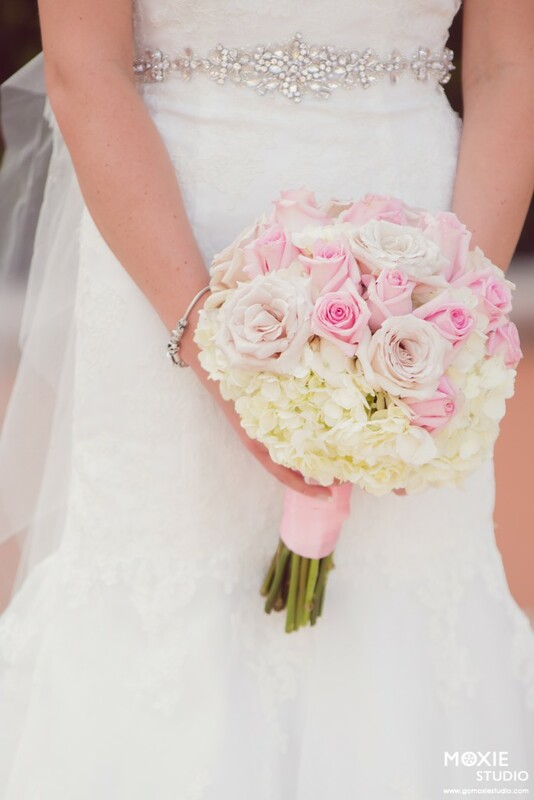 Floral By Dzign ended up hand-crafting a beautiful bridal bouquet of quicksand roses, pink roses and hydrangea wrapped in pink ribbon. 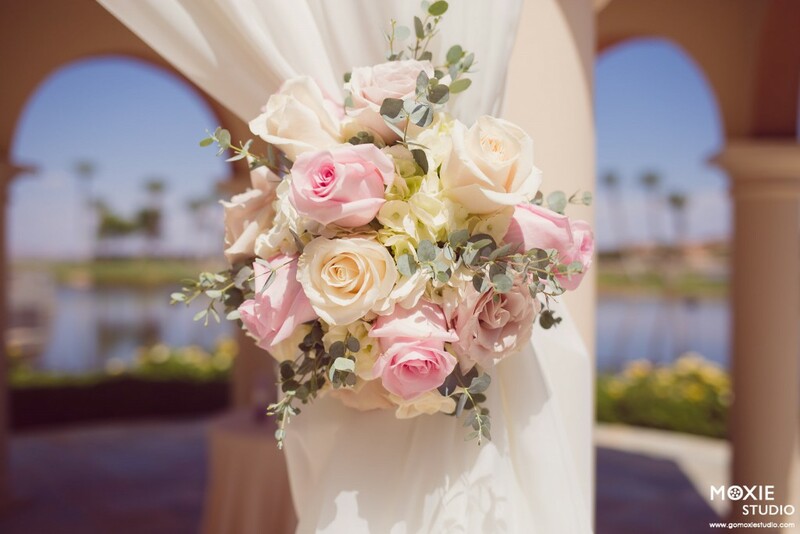 We created matching arrangements for the bridesmaids’ bouquets and, for the groom’s boutonniere, our floral team went with a simple ivory rose accented with greenery, tied off with an ivory ribbon. For the reception, Amy wanted something a little darker and more moody, so, rather than carrying the ceremony aesthetic indoors, we created an entirely separate aesthetic for this part of the celebration. Switching up color palette and theme isn’t something we often get to do for weddings, so we had so much fun bringing the couple’s dual-design vision to life. Linen By Dzign brought in a black pintuck linen for guest tables. 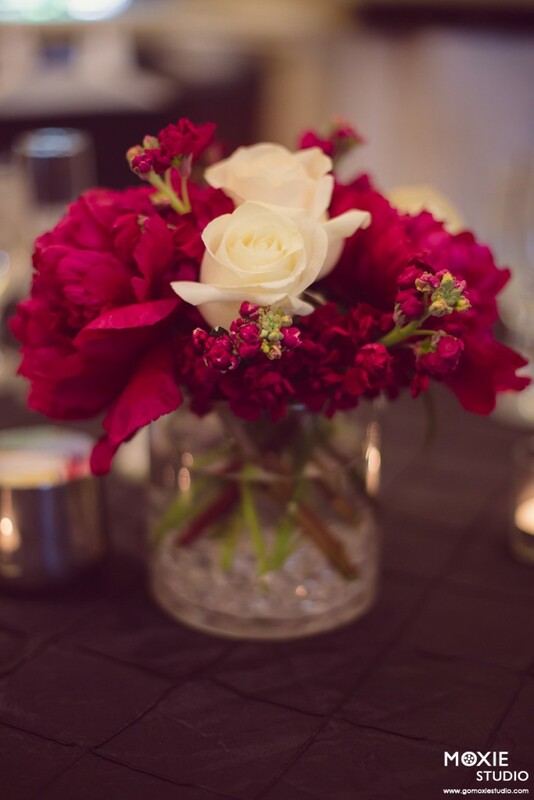 For centerpieces, we went with burgundy peonies and burgundy stock with white roses to help lighten the arrangements a bit. The overall aesthetic ended up feeling super decadent and romantic, which was exactly the look the pair was going for. Overall, we had a ton of fun designing Amy and Dustin’s Westin Las Vegas wedding. 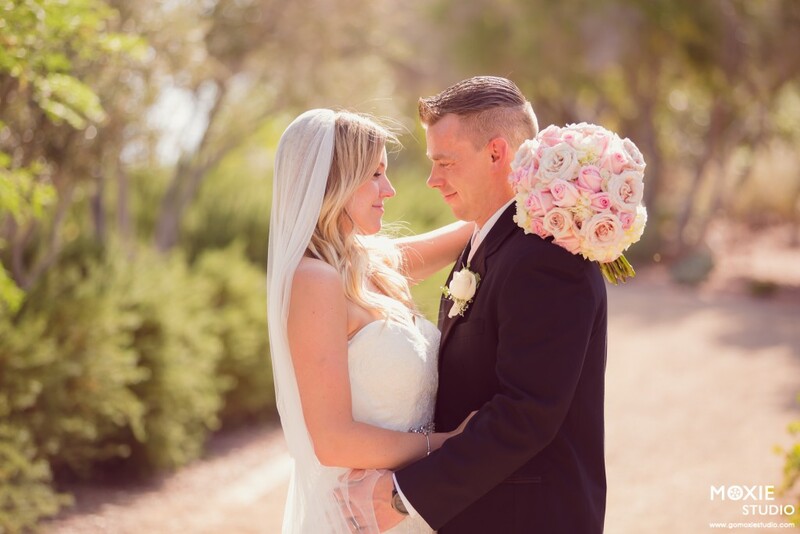 Both their romantic springtime ceremony and their decadent-and-dark reception turned out beautifully, and we were honored to be a part of such an important day in their lives!